That’s what I’m now doing with the second novel. At least for a while, even though my inclination is against exclusivity. What changed my mind about it, at least for this book, was a recent 99-cent promotion of the earlier novel “The Awful Mess” to all the retailers. Along the way I discovered some things that surprised me. Which retailers give you a better “sales tail”? For the Canadian market, Kobo supported by BookBub proved a touch stronger than Amazon — but Amazon appeared to reward a strong performance better. 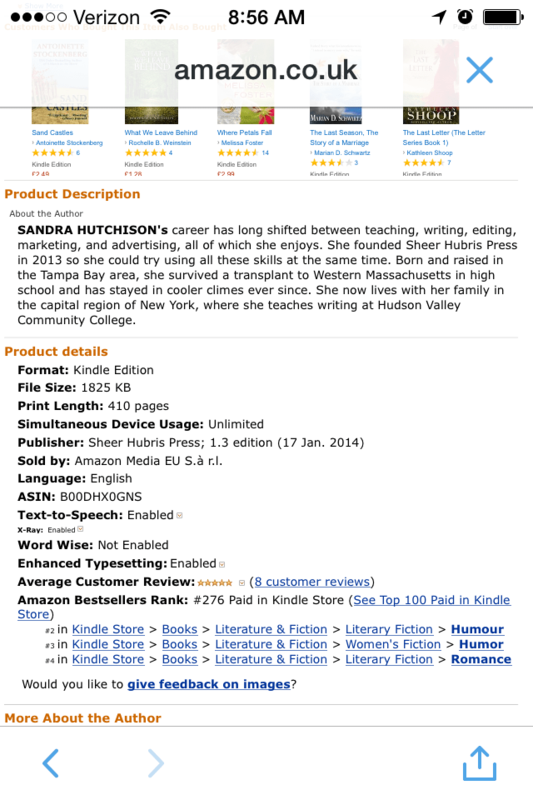 I sold 77 copies of “Mess” at Amazon Canada during its recent 99-cent promotion (supported by BookBub to Canada). 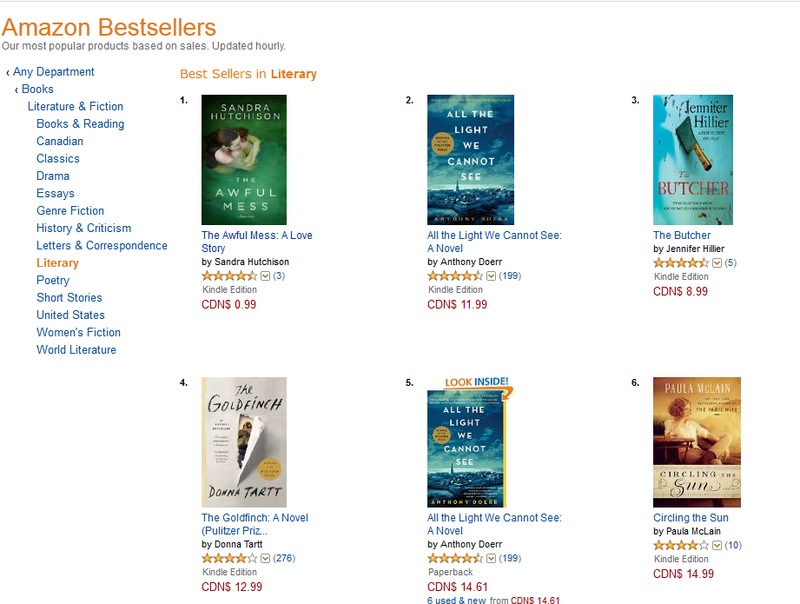 This landed me — very temporarily, of course — at #1 in literary fiction. For days after the promotion, I was still floating near the top. Almost a month later, it has sunk to #28,000 and my discoverability there has pretty much evaporated. But I’m still selling the occasional copy. On Kobo during that same promotion, I sold a little more — 80+ copies in Canada. But while those sales were being racked up, my sales rank just kept worsening. Since then I’ve sold more — yes, there’s been a bit of a tail, probably from also-bought appearances. I have gotten a couple more ratings to add to what had been the solitary review there. But to this day, my sales rank has only worsened. It’s as if sales simply don’t matter to Kobo, or maybe sales outside the U.S. don’t matter (one single sale, about a month ago, did suddenly halve my sales rank). I’ve noticed this for months now. And although I did have some promotional support across retailers for a U.S. sale (just not from BookBub), not a single copy sold in the U.S. It didn’t used to be that way. There was a time when selling a few books on Kobo could push me into the Top 100 at least temporarily. People would see the book. It’s almost as if Kobo has redesigned their algorithms to punish promotions, or redesigned their store front to discourage browsing for anything but top titles. I asked them via Twitter about this. No response. I tried to ask them on my dashboard, even though the character limit there makes it difficult. Also no response. No doubt I could try sending an email, but … meh. Maybe they’ll read this and explain what is going on. With BookBub support I also sold more than 200 copies in the Amazon UK store, more than double my Canadian sales, although my rank didn’t get quite as impressive. (I sold four copies in the UK via Kobo.) And there have been some continuing sales, as well as a couple of reviews. Back home in the U.S. at Amazon.com, where I had some promotional support from eReader News Today, Fussy Librarian and Read Cheaply, I sold just over 160 units during the promotion. Not too exciting at a 35% royalty. However, today, three weeks later, I can do a search for humorous literary women’s fiction with four stars or more (granted, this is fairly specific), and “The Awful Mess” shows up on page two. I’ve also sold copies of my second novel there in the days since, presumably to people who wanted to move on, though it’s impossible to know for sure. Now, none of this changes my mind about where “The Awful Mess” is — widely available. That’s backlist for me, now, and it does sell here and there without much work on my part. But that second novel, “The Ribs and Thigh Bones of Desire” has sold exactly one copy at Kobo since I made it available there, despite at least one (non-BookBub) multi-retailer promotion. Last time I tried to follow my link to Ribs at “Nook” it wasn’t even available, for reasons I don’t know (my price promotion at Nook with BookBub didn’t take because they didn’t change the price fast enough.) No doubt it’s possible I screwed something up. But that’s another reason it can be preferable to keep things simple. At iTunes (via Smashwords, since I don’t own an Apple computer), I saw some nice sales of “The Awful Mess” during my promotion — over 80 copies sold. Before the price promotion, I was actually seeing some fairly steady downloads of my free single on iTunes, and usually a few of the people who downloaded the freebie would move on to buying one of the novels. But since the price promotion? Crickets. I’m probably promoting the freebie less, but clearly there’s no tail from the sales I earned. I don’t shop on iTunes myself, so I don’t know how discoverability works there. From where I sit, though, I’ve not only got none, I’m actually doing worse than I did before the promotion. And then there’s Google Play. I sold 11 copies during the promotion. Not a single one since. Only one or two before the promotion. (Ever.) However, I spent hours trying to get my price discounted properly for the promotion, and more hours trying to get it back to where it needed to be to prevent price-matching from Kindle. The Google Play Books Partners Center is a conspiracy hatched by data nerds to make English majors cry. Which brings me back to Kindle, with its simple and responsive author interface. Sales since the promotion have been fairly steady, if not exciting. I feel I’ve been rewarded for the promotion and ongoing sales with decent discoverability (of course, I also recently discovered I’d left my royalty at 35% by accident, so I suppose they might have been more excited about promoting it because of that.). I feel the kerfuffle over Google Play’s discounting was handled in a friendly manner once I got past the vaguely threatening first warning email. The other thing that attracts me to Kindle Select right now, though, is exactly what drove a lot of folks out of it recently: the joy I’ve taken in watching the occasional Kindle Unlimited reader finally taking on my second novel “The Ribs and Thigh Bones of Desire” from back when it was available that way. And, finally, I’ve come to the inescapable conclusion that not offering “Ribs” free while I could reduced its sales potential. Going free is still the best promotional tool for an unknown indie author short of a U.S. BookBub price promotion, which I haven’t been able to get. Granted, my review average is undoubtedly higher now than it will be after going free (you get a few nasty folks who don’t bother to read descriptions during free days, perhaps because they enjoy being outraged). But that’s just the price I’ll have to pay. This title hasn’t had a chance to really catch on the way it might if thousands and thousands of people download it and at least a chunk of those people actually read it. That’s assuming I can make that happen. I still don’t expect it to do as well as the first book did. It’s gotten a lot tougher out there, by all accounts. This book is less of a crowd pleaser, though some readers think it’s better (I include myself in that). But I’ll never really know until I give it a try. So,although I’m still a bit wary, I’ll be setting up a free promotion eventually, and the only easy way to set that up is through Kindle Select. In the meantime, going to Kindle Select also lessens my product management duties and simplifies my marketing. Now, ALL of this promotional effort is still a bit premature in the sense that I only have two novels and the third isn’t ready for pre-order yet. If you really want your promotions to work for you, you need a stable full of books that can sell along with whatever you’re promoting. But letting the few you have put out sink into oblivion doesn’t make it any easier to resuscitate them when the time comes. So I’ll work with what I have. And at this point, Kindle Select simply looks like the best deal for a title that hasn’t found its legs yet. What do you think? Does your own recent experience match this, or vary from it?